It wasn’t a case of a little less conversation when Sarah Merritt caught up with Marc Priestley at the London ePrix recently – chatting through Marc’s career, it was very clear that F1 was always on his mind and was a subject that got him all shook up from the very start! 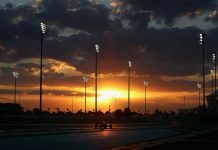 Have a read as Marc, aka @F1Elvis, talks about F1, Formula E, Sky Sports F1, his show Driving Wild, and his time at McLaren, covering pit stops, that 2008 finale in Brazil, and a certain driver getting locked in the toilet! Sarah Merritt: Whilst I know a bit about you, Marc, it is always good to look for new and original things when you chat to someone. Although we are used to seeing you on TV now for Sky, and the Formula E coverage, imagine my surprise when I found out that you nearly ended up going down a different path…as a footballer? Marc Priestley: Well I’m not sure how true that is! (laughs). I think the answer to that is that I would have loved to have been a footballer, and I was pretty good. I’m sure, like most kids, up until my early teens, I thought it just might happen. I got to a level when I was 13 or 14 where the 18-year-olds at the same club were getting paid, so you really start to believe at that point! I was never quite at the level you need to be at, and also motor racing kind of took over. In my mid-teens I got into it in a massive way and, of course, it’s every weekend and it takes over your life, so you have to go one way or the other. I still play football, I love it, but motor racing was always going to be the career for me. SM: So then you studied motor vehicle technology at college, headed to Caterham and GT3, then moved to Formula 3 and Formula 3000, before joining McLaren in 2000 as part of their test team? MP: I always wanted to work in Formula 1, and so all those other formulas (including a little bit of Formula Ford in there as well) were towards that. I followed Jenson all through his career – when I was doing Formula Ford, he was, and then we both coincidentally went on the Formula 3, and then he went on from there to F1, whilst I did Formula 3000. All that time, I was writing to every single Formula 1 team every six months harassing them; I still have a stack of rejection letters at home. Eventually, one day, I got a positive response back and, luckily for me, not only did I get my foot in the door with Formula 1, but it was with McLaren – who at the time were world champions – so it was a dream come true. I can still remember the phone call to my mum, who was the first person I called, saying “I’m a Formula 1 mechanic!”. It was the biggest thing in my world at that point – it was brilliant. SM: Was the team as you expected on arrival? People often say that they think the team are very grey, and corporate from the outside, until they actually work for them, when they find it to be much warmer an environment. MP: I was like a rabbit in the headlights when I first arrived because all I’d ever done was watch them on television, so the cars, the garage, and even the people in the garage, were kind of like heroes to me. I was only 22 or 23, but when I arrived, everyone was really friendly. It was a very serious environment in that we were doing a serious job and there was no room for mistakes, but even over the years of working there, there was still the perception from the outside – that I’m sure Ron deliberately creates – that it is a very grey, serious, strict and highly professional environment. SM: I don’t think Ron would want that to get out…! MP: Well, Ron had his wild moments as well – we’ve been on nights out where I’ve bumped into him in a nightclub, and you think…hang on, neither of us should be here, shall we just keep this quiet! It was a lot of fun, but when you are doing the actual job it was very serious, as I am sure it is with most teams. SM: Of course, there was a lot of travelling involved; what was your favourite destination to travel to in the calendar and why? MP: I used to quite like the ones that were in city centres. People often ask me what my favourite race was, and it depends on how you look at it. Spa is obviously a wonderful circuit with some amazing racing, but as a destination for a week away, it’s a bit dull as you’re out in the sticks. So I always used to look at it that we were going to do a job, we were away from home a lot, and so you have to balance that with a decent social side of things. When you are in a city centre, you can explore that city and have a walk around. With Singapore being a night race, you’d finish work at 1 or 2am, and the city was absolutely buzzing at that point, so you could go straight out until 6am, and still have 5 hours sleep before you’d have to be back at work! SM: You’ve worked with so many drivers, including the likes of Mika Häkkinen, David Coulthard, Olivier Panis, Kimi Räikkönen, Juan Pablo Montoya, Pedro de la Rosa, Alex Wurz and Lewis Hamilton. Is it possible to pick out a driver that you feel you had a special relationship with or a bond? MP: I don’t really have a favourite as such, but I definitely had, and still have, the best relationship with Kimi. I worked on his car for a lot of the years that I was there – in fact, all of the years that he was at McLaren, and the crew that we had on Kimi’s car had a really special bond. I’ve not had that with anybody else, and I still can’t quite put my finger on why – that’s something that people always ask, and I don’t know why, but I think he completely trusted us for some reason. He doesn’t trust many people, he has a very small core group of friends from back in Finland that he has grown up with, and he included the four or five guys from his car in that group. Even today, I go and have dinner with him when we’re at the track, and catch up with him. SM: I guess that is a side of him that we don’t see perhaps when he’s in the pen and doing interviews, where it may not come across quite as you are describing it, so it’s really nice to hear that. MP: He’s a very different guy when you get him away from the race track, and even during the time that we were working together. I think because we had a lot of fun within the team, didn’t take it too seriously, and we didn’t treat him like a celebrity. Kimi and his wife at the time, Jenni, were probably the biggest celebrities in Finland at that time, and I’ve been to Finland with him – they were like Posh and Becks there! He couldn’t do or say anything without being hounded, and people used to pander to him but we didn’t do that – we just treated him like one of the lads and I think he appreciated it. SM: Now I know that you always have many stories to tell about things that happened during your time with the team – is there one that you’d like to share with the Badger GP readers? MP: I have got some brilliant stories, some of them definitely can’t be printed! For example, I can remember being in Brazil when I had first started with the team, and I was working with David Coulthard. Now, in Brazil, you didn’t have motorhomes as such but little portacabins out the back, and there was a portaloo next to it. It was about ten minutes before free practice, and David had gone to the loo, and somehow he’d broken the lock and was stuck inside! I got a text message from him saying “Can you bring a screwdriver to the toilet out the back?” and we had to take the door off of its hinges to get him out! Of course, nobody knew, we got him out and into the car and off he went, but it was quite close to being disastrous! When you work in this environment people from the outside are generally in awe of the celebrities – in this case, it’s the drivers, but to us, they were just another member of the team. We would have an incredible laugh with them just like we would any of our mates, and of course, we all travelled the world together. Back then, I used to describe it to people as 17 or 18 stag weekends a year, and it was like that! We used to get away with stuff that you would never get away with now. I’m sure that in the era before that, it was even worse, so there’s all sorts of stories I could tell, and there’s probably a very good book in there at some point. I think everybody who has worked in F1 will have some tales like that, and if it was just a group of mechanics, it wouldn’t be much of a story, but when there’s a driver involved, people are fascinated by it! SM: As a mechanic, what was your favourite car to work on? SM: That was the one that Alex Wurz tested, I believe, that he had a big crash in? MP: Yes, I think that he refused to drive it in the end. He had a massive accident at Paul Ricard, for which we had the CCTV footage from the circuit, and it was one of the biggest crashes I’ve ever seen. As you know we used to test behind closed doors back then, which you aren’t permitted to do anymore. SM: When I spoke to Alex at Goodwood, he said his favourite had been the MP4/17D, and described it as putting on his most comfortable pair of jeans, as it fitted so well around him. MP: That’s a good way of describing it. Yes, I remember because we had that one with Kimi driving, and he very nearly won the championship with it. As a mechanic, the ones that one reliably and obviously are quick are the ones you love. Some are a pain to work on. I remember whilst Adrian Newey was at McLaren; he was a brilliant designer, but not a single thought for how easy they are to work on goes into his designs. I asked him once, when you set out to design one of these cars, how much thought goes into the practicality of changing parts and working on it, and he said none. We used to have big bargeboards and deflectors, and because it was better for the aero, rather than have a split so that you could slot it over the wishbones, you had to take the whole wishbone off and feed it through a little hole. He was so focussed on the time little gain that he got from the aero, but this added 45 minutes work to a simple task on the car. SM: In a time critical situation like coming up to quali, that might make the difference between getting that car out on track or not? MP: In those really time critical situations, we would just not tell him – take a saw to it, and then cut it, slot it and put in on, and put a piece of tape over it! But that shows how focussed he was on those things. SM: Did you ever get the opportunity to go up onto the podium on behalf of the team? MP: No – I wish I had. Back then it wasn’t really done that way, it used to be just Ron or Martin Whitmarsh generally, or Norbert Haug occasionally for Mercedes. It’s a really nice touch that they’ve started sending guys from the team up, and I would have loved to have done that because I bet that is an amazing experience. I do have a couple of the podium champagne bottles that Kimi gave me over the years – they are in pride of place in my home. SM: You were part of the pit crew – what role did you play? MP: Over the years I did a number of the roles. The longest role was right rear wheel gun. My first ever job in a pit stop was at my first race, and I think the team manager gave it to me because I was such a young inexperienced kid. He gave me the job of putting on the spare nose cone, which doesn’t happen all that often, but of course, it happened in my first race! It’s probably on YouTube somewhere – I was shaking like a leaf, and the car came in, and my bit went quite smoothly. However, it was a disastrous pit stop overall from what I remember as I think Kimi had been off, obviously sustained the nose damage and been through the gravel, and a piece of gravel had got stuck down between his back and the seat. Of course, that was pretty painful, but he couldn’t get it out – I’m pretty sure that the pit stop was about two minutes long whilst people were trying to remove it! SM: I would imagine front jack would be terrifying as the car is coming towards you, you have to trust the driver? MP: It is as they are hurtling towards you. Back then the pit lane speed limit used to be 120kmph, so I would tell people it was like standing in the fast lane of the motorway just hoping that at the very last second they’d brake! The brakes were so good that probably 15 metres from you, they’d still be doing that speed! DC knocked us over once. He came in a bit crossed-up and wiped out the right rear corner, where I was, but no-one was hurt, fortunately. I have to say though, that adrenalin rush was the one thing that I missed more than anything when I left the team – the winning races was brilliant, and the job and travelling with the guys was great, but that immediate adrenalin rush of a pit stop was the one thing I can’t replace. SM: I know as part of your public speaking, you talk about pit stops with businesses and draw analogies with efficiencies that can be made down to the millisecond, so it seems right to mention Williams at this point. There’s been an incredible consistency this year, and Sky recently put together a very interesting piece with Ted Kravitz analysing this. What are your thoughts on this? Practice makes perfect? MP: There is a lot of that, but I think the biggest thing with Williams this year is that they’ve changed the thread on the hub that the wheel goes onto. They’ve gone for a very course thread a bit like Ferrari’s, and I think it’s something like only three full turns of engagement is all the way on, whereas before, it was a much finer thread which firstly means you’ve got to turn it further and more to get it on, but also, finer threads are just more easy to cross thread and make mistakes with. It’s quite simple really but that, together with lots of practice. Also, the teams are quite different now in that they look at it in a far more scientific manner than they used to. They use tools like overhead camera’s to analyse back in slow motion what everyone is doing, and everything is rigged up with sensors so that you get a full dataset from every pit stop. This shows that teams now put as much effort into that as they would into shaving tenths of a second off a lap time. Absolutely fair play to Williams – they’ve got it spot on, and are doing it consistently. Most teams will do a pit stop of around two seconds, but doing it every time is the key. Some teams will also back it off slightly to make sure they do it consistently, but what Williams have done is push the absolute limits and still keep it consistent, and that is what’s most impressive about them. SM: Working on Lewis’s championship winning car in 2008 must have been fabulous and memorable. Do you recall the range of emotions you went through in the very famous Brazil race? MP: I’ll never forget it. It’s a bit cliché to say it was an emotional rollercoaster, but that last lap really was. Going into the race, I still don’t remember thinking we were really going to win it. I knew we had a chance, but we had been there the year before with a chance and not come out on top. Going into the last lap, the whole garage was so tense – at one point in the lap, we were going to be champions and everyone was clinging onto each other, then a couple of corners later, it looked like we weren’t going to win, and the mood just dropped. It was so up and down, and to win it on the last corner of the last lap of the last race of the season, I don’t think you’ll ever repeat that. I see it as one of the great sporting moments, not just Formula 1 moments. I’ll never forget it, and the emotional outpouring afterwards was just unbelievable! SM: I wouldn’t have wanted to pack up the garage after that if I had been you! MP: We did have a big celebration – it was the last race of the year anyway, so we were going to have a celebration as it was, but to have that as well was just amazing. Lewis was just a kid really, and to see him be World Champion in just his second year, and achieve his goal in life at the same time as it was my dream in life to be on the mechanical side of it and do the same. To achieve it was a dream come true for so many people in that garage. I’ll never forget it. SM: I have a McLaren book at home that has a photo of you all celebrating in it. It’s quite entertaining to flick through a book like that and pick out the people you know, who is still there, like Taff (Paul James – McLaren Chief Mechanic) and who is in a different role now. MP: It’s a sign of a good team when so many people stay for so long. There are people still working at the factory who were working on Ayrton Senna’s car. When you work in any sport, I’d imagine, it gives you moments that you’ll never forget because it’s all about emotion and competitiveness – anyone who works within it is competitive. I always looked at it that just to get into F1 was my goal in life, and I was over the moon that I had achieved that. If I’d died the next day I’d have died a happy man! Then at McLaren, we were winning races, and that was the best feeling in the world, so to win the championship was the Holy Grail in Formula 1 terms. I feel incredibly lucky to have done that. Lots of people work in F1 and don’t get to experience the highs of winning a race, let alone a championship. SM: I have to ask you the obvious and logical next question then, Marc – why did you give it up? MP: I’d done it for almost ten years by that point, so at the end of 2008 when we won the championship, I’d been thinking about cutting down on the travel. McLaren were great; they allowed me to go back into the factory whilst I worked out exactly what I wanted to do, so I didn’t have to travel as much, but was still working with the team from MTC. Then, really, I started to realise that I’d had such amazing experiences through my time there, and from talking to fans, I realised how people looked at Formula 1 and put the drivers and the team up on a pedestal. This made me see that I’d had experiences that so many people would want to share, read about and learn about. I started writing about it, at first in my blog, which I really enjoyed, and for various websites. The response I got from fans was brilliant, and it spurred me on to do more. I did that for a few years, but it is difficult to make money out of writing about F1 as so many people can do it. I decided to always focus on the fact that I had this unique experience that gave me a unique perspective on it, and after a while, the producers of BBC Radio 5 picked up on my writing and decided it might work on the radio, and got me in as a pit lane reporter alongside Jennie Gow. The broadcast side spiralled from there. I fell in love with it on that first day at Silverstone, and I realised at that point that it was definitely what I wanted to do next. SM: We’ve seen you on Sky a lot more recently, how are you enjoying that? You seem to be popping up all over the place! MP: I do the midweek show, the F1 Report, and I’m doing every one of those this year, either presenting or as a guest, and I really enjoy it. As I said to you before, when I got into Formula 1 as a mechanic it was an absolute dream come true and I knew I was in the right career – as soon as I got the gig with BBC doing the radio and reporting, I felt exactly the same. I’m still hugely passionate about Formula 1, and one of the things I hope I do through TV now is to try and share or explain some of the more complex parts of the sport in an understandable manner – that’s what I set out to do at least! With the insight that I have, it’s hopefully slightly different to the likes of Ted and others. What broadcasters typically do across F1 is use ex-drivers for a lot of the opinion – which is obviously a natural thing to do and they have a hugely valid opinion – but what I’ve tried to convince Sky to do is to use me as well for an opposing, or different, type of opinion, as not many broadcasters do that. It’s the biggest team sport in the world so why not get somebody from team to come and explain it? SM: You’ve had a great series on the Discovery Channel called Driving Wild – how did that come about? It’s a really unique concept, did you come up with the idea to visit some of the places featured? MP: It’s the most fun I’ve had ever, I think! It was with a production company that I’d done some work for in the past, just odd bits and pieces, and the executive producer came to me with a vague idea of coming up with this kind of show. We sat down together and developed into what it is now. The ideas that made the show were wild and whacky, but I can’t even begin to tell you some of the ones that were on the long list that didn’t make it! So even the process of developing it was brilliant fun, and all the way through I never really imagined that it would get made, but they put it together and went to the Discovery Channel, who thought it was a great idea, and said that they were going to pay for it! It was another dream come true for me – I keep pinching myself with how lucky I’ve been with all of this. I’ve travelled a lot with Formula 1, but we went to 6 places that I’ve never been before like Cuba, Mexico, Thailand and South Africa, and working with these most ridiculous types of motorsport, so for someone who’s into that, it just couldn’t be more up my street! SM: It’s been great to watch, I was waiting for you to tell them all about your nickname! MP: It was funny as I introduced myself to most people as Elvis, and the majority just never questioned it! There were some great guys in all the different groups around the world that we went to work with and I’m still in touch with most of them – we’ve got little WhatsApp groups from each place, and some of them have even been over to the UK and we’ve hung out. I got to play with some amazing cars, boats and all sorts of vehicles, but I also met some great people. I hope what was nice for people that it wasn’t all about the engineering, there was a bit about the culture of the place and the history of the sport that we were working with, so it was a little bit different from just the purely garage based shows that are just about transforming a car. SM: It was nice to see you getting yours hands dirty too, I bet you’ve missed that? MP: It’s been a while! My hands haven’t been that dirty for seven years, so it was nice. It’s kind of what I do, what I enjoy, the engineering side. One of the best things was that these were places that didn’t have any money – they’re not on Formula 1 budgets – but they are just as competitive and inventive, if not more inventive because they haven’t got any money, and have to make good with what they’ve got. I’ve learned just as much as I hope I taught them from my Formula 1 experience. SM: You’re part of Formula E coverage in the UK with Jennie Gow, giving us technical insight. 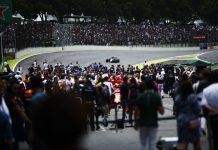 Coming from an F1 background, what were your initial thoughts about the race series ahead of Season 1? Did you perhaps some reservations that were ultimately proved wrong? MP: Do you know, I didn’t – when the concept came about, way before any racing or testing had taken place, I remember being fascinated by it. I’m all about technology, and particularly new technology and pushing the limits, so actually, I pushed to be involved with Formula E more so than anyone coming to me asking me to be involved. I was desperate to get involved with it. First of all, I went for Nickie Shields’ job, and she got it, and I didn’t, and I was really disappointed at the time because I wanted to be involved! It was only after ITV came on board to cover it that that I managed to get my involvement. I was a big fan of it then, and I’m still a big supporter of it. There’s a big technical side to it which I enjoy explaining and talking about, so this was another opportunity to do that. The technical side is moving forward probably even faster than the likes of Formula 1 because everyone is still learning, and there’s still such an opportunity for the teams and the manufacturers to exploit this new kit – with every race they are still learning how best to use it. It never stands still and is always moving forwards quite fast, which is what I love. SM: What do surprises do you think season 3 will hold for us? Will it be a case of teams with more money to plough into development moving further away from the smaller teams? MP: There is a risk of that, of course, as with any formula. Formula E have been quite good in keeping a limit on what you can develop. It would have been very easy not to, and I have to be honest, when I first found out that we weren’t developing the battery technology this year, I was a bit disappointed. However, I totally get why, because it’s very easy to just say “do what you like” and we’ll push the technology forward really quickly, and Formula E can be responsible for developments in battery technology, but you very quickly will alienate the smaller teams. It’s fine if you’ve got eleven manufacturers all doing that but we haven’t, and we are unlikely to in the short term, so just like Formula 1 you need the smaller teams to be part of the show, and for that reason, you’ve got to keep a cap on it. Yes, Renault have spent a lot of money in Formula E terms – nothing like the amount they’d spend in Formula 1 however – but what they have done is develop a system which now everyone else pretty much knows, so I’m sure next year you’ll see a lot of people moving to that kind of idea – very lightweight carbon fibre. We have a number of different solutions this year, but I’m pretty sure we’ll start to see more convergence, and of course teams don’t need to spend money on researching and developing the idea as Renault have done it, so costs will come down in that sense. This was a really big year for the teams because they had almost a blank piece of paper from the battery backwards, and it was nice to see that people thought differently about it and came up with different solutions. There’s a couple of ideas that have proven to be more successful than others, and I’d imagine people will start to head in those directions. SM: Formula E is great for Fan Engagement and social media interaction, do you think F1 could learn some lessons from it? MP: Yes, it definitely could. I think one of the biggest strengths of Formula E is the way that it’s engaged with fans. Fanboost has been controversial and even the drivers are not fully behind it, but I think you’ve got to embrace the fact that they are being brave to try it. They’ve been really good at adapting things – they haven’t said it will be a certain way with no changes, and over the last 2 years, they’ve had ideas; some of them have worked, some haven’t, some they’ve tweaked, and they are quite often adjusting things mid-season. I applaud them for that, as it’s a learning experience for them as much as the teams and everyone else. I absolutely love the podiums – I think it’s one of the highlights of Formula E. Sticking the podium in the middle of the fan zone is just genius. Formula 1 could definitely do something similar. Some of the TV pictures are just spectacular, and I’m sure for the drivers it creates moments that they’ll never forget. I think London last year was the first time they’d done it and it was spectacular – my family were here in the middle of it and I remember Sam Bird saying he’d never experienced anything like it! It was great catching up with Marc, and hearing his thoughts having been on the inside with that unique team perspective was fascinating – I can’t think of a better person to have a pint and listen to stories with, so if you see him out and about, buy him one immediately! It’s brilliant to see that he hasn’t lost any enthusiasm for the sport that he loves, or talking about it. Here’s hoping Driving Wild gets commissioned for a second series and look out for Marc on the Sky Sports F1 Report each week.